For Valentine’s Day, and in celebration of the New Year, Naples Grande Beach Resort & Cheeca Lodge & Spa are offering specialty treatments each with their own unique personality and twist. 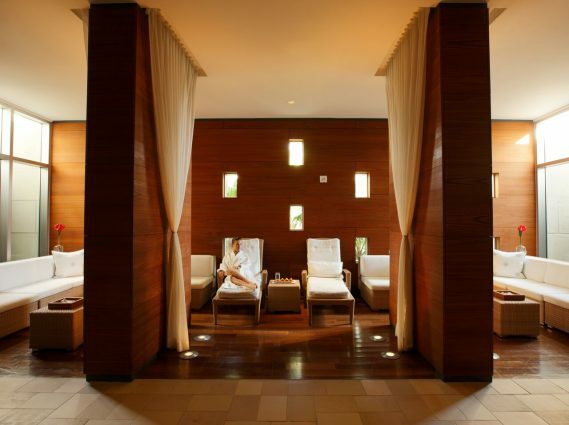 The Spa at Naples Grande Beach Resort is a freestanding facility four Japanese style pavilions featuring 12 treatment rooms, a floating hair and nail salon, plus a couples villa for romantic treatments for two. The first part of this 100-minute romantic ritual will be performed by just you and your partner in our private couple’s villa using a scrub featuring French Chardonnay grape seed oil, one of the most powerful antioxidants found in nature. This truly blissful experience begins with a couple’s shower and a delicious, aromatic, mutual scrub exfoliation. Then you will apply a silky hydrating treatment to one another while acting as skilled therapists. Next you will enjoy a relaxing 50-minute Chardonnay couples massage performed by two of our intuitive therapists who will utilize Swedish techniques to increase circulation, reduce tension and induce deep relaxation with Chardonnay grape seed oil as well. This romantic experience will relieve stress and bring an overall sensation of well-being. End your journey with a glass of Chardonnay wine and chocolate covered strawberries served in the spa sundeck area. Our Chardonnay massage utilizes Swedish techniques to increase circulation, reduce tension and induce deep relaxation. Featuring French Chardonnay grape seed oil, one of the most powerful antioxidants found in nature, this truly blissful experience will relieve stress and bring an overall sensation of well-being. End your journey with a glass of Chardonnay wine and chocolate covered strawberries served in the spa sundeck area. Renew for the new year! Get Signature Cheeca Welly Bottle with our bestselling treatment. Spa experience includes access co-ed relaxation lounge, men’s & women’s steam room, coffee, specialty teas, snacks, and infused water. Indulge with, or without your better half. You will be welcomed into the Spa with a glass of Champagne and chocolate covered strawberries. Choose just one, or two treatments. Gift Cards are available for these specials as well! Just stop by or call us directly at (305)517-4485. Spa experience includes access co-ed relaxation lounge, men’s & women’s steam room, coffee, specialty teas, snacks, and infused water.